Since Innsbrook Condos first discussed the topic four years ago, Ruidoso has become renowned for its ziplining, due in large part for the beautiful landscapes around us. All experience levels are welcome, and the locations are all overseen by professional guides, who will take you through every step of the way. The best locations are only minutes from the Innsbrook Condos. 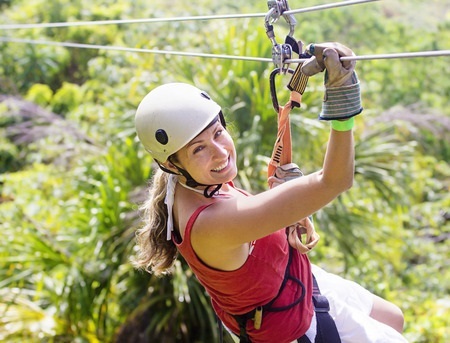 Here’s a list of several places that you can now zipline on your next trip to Ruidoso, New Mexico that are near Innsbrook Condos. Starting at an elevation of 11,489 feet, Ski Apache takes visitors flying at 60 miles per hour over the Sierra Blanca Mountains with a rideable distance of 8,890 feet—which, at one point, was one of the longest in America. You’ll soar in the sky like never before able to see miles of landscape beneath you. The longest run without stop is 5,280 feet, and overall, the experience takes about an hour and a half. For tickets, you can check out Ski Apache’s site here. The Apache Eagle Ziprider at the Inn of the Mountain Gods is the newest one to enter the market, opening in 2015. This one, however, takes you over Lake Mescalero, starting at about 7,185 feet elevation. It’s a shorter ride than Ski Apache, with about 2,668 feet of rideable distance. But don’t let that stop you from reaching peak speeds of 55 miles per hour. If the lake is calling you, head to the Inn’s site here. There’s always something fun happening in Ruidoso, which is what makes Innsbrook Country Club and Resort the place to be. And ziplining is at the top of that list. With dozens of condos and homes to rent at Innsbrook Country Club and Resort, you can find all the space you need for a family vacation, business retreat or major conference.